Students working after hours at the Liquid Rocket Lab. Thanks to the National College Resources Foundation’s $1.67 million grant, work is well underway at the Cal Poly Pomona Liquid Rocket Lab. 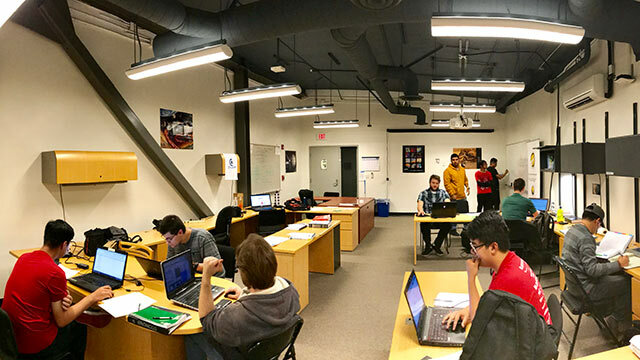 A team of more than 70 students and nine faculty advisors are working toward launching a liquid-fueled rocket 45,000 feet to win the top prize at the FAR/Mars Society Launch Contest. Currently, the team is preparing for its first engine test on Dec. 9 – flowing inert liquid nitrogen through the engine. Typically, a project of this magnitude would take 5 to 7 years, but teams in this competition are working around the clock to get it done in record speed. Cal Poly Pomona’s rocket will be ready for lift off on May 5, 2018. This is the university’s first liquid rocket project.